The ‘Conception to Age 2: First 1001 Days All Party Parliamentary Group’ today published their report ‘Building Great Britons’, making recommendations to enable children at the end of their first 1001 days to have the social and emotional resources to form a strong foundation for good citizenship. “We welcome the publication of this positive report with clear and strong recommendations for actions to be taken. The evidence behind the importance of the first 1001 critical days on the development on children is immense, as the report reflects and Doula UK is proud to have been involved with the preparation of the report. It is good that the report covers that problems can start before birth, that continuity of care from midwives for all women is needed and that birth and infant feeding can have a significant impact on the mental health of parents and the neuro-development of babies and children. We also particularly welcome the recommendation that a preventative approach is taken and that Children’s Centres should become a central source of support for parents. 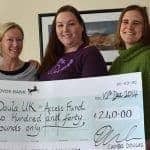 Doula UK looks forward to working further with everyone involved in the report.